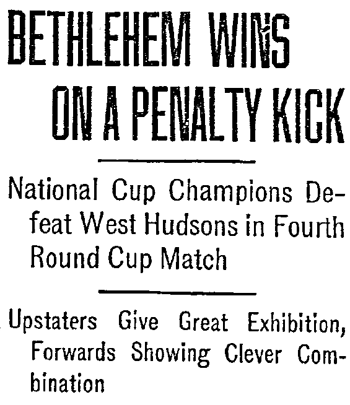 Draws and winter weather would prove to be a continuing factor in Bethlehem Steel’s campaign for a second National Challenge Cup championship in the 1915-1916 edition of the tournament, known today as the U.S. Open Cup. In the third round on January 15, 1916, Bethlehem hosted American League side Hibernians on a frozen East End Field in zero degree temperatures, finishing the day 6-0 winners. Bethlehem drew the West Hudson team of Harrison, New Jersey for the fourth round, although winter weather and poor field conditions would see the match postponed four times before the teams met at Federal League Park in Newark on April 2. With the victory, Bethlehem would be on the road again, this time to face Chicago’s Pullman FC on April 16. It would be the longest journey yet taken for a game in the short history of the national championship tournament. 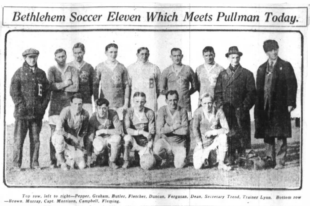 Pullman FC had made it as far as the quarterfinals in the 1913-1914 National Challenge Cup, losing 2-1 to Niagara Falls Rangers in the inaugural edition of the tournament, reaching the quarterfinals again in the 1914-15 tournament only to lose to the Homestead Steel Works team of Pittsburgh by the same scoreline after extra time. In the 1915-1916 series, Pullman finally broke their quarterfinal curse, defeating Cleveland’s Thistles 3-1 on the road. The Chicago Daily Tribune reported on April 11 of the home team’s preparations for their Pennsylvania foe, “For several weeks the Carbuilders have been drilling after work on their own field, which is close to the Pullman works, and have been exercising in the Palmer park gymnasium.” The report noted it was to the Pullman team’s advantage that it had its own field and a gymnasium to train but that Bethlehem “had similar advantages” thanks to the “strong financial support” given to the Steelworkers by President Charles Schwab of the Bethlehem Steel Company. Bethlehem Steel departed for Chicago via rail on Friday, April 14, traveling on the Lehigh Valley Railroad first to Buffalo before heading to Chicago on the Lake Shore Limited. Despite travelling aboard “a special Pullman,” it was a long journey of more than 24 hours that finished in Chicago only 16 hours before the match. The game would be played at the Hyde Park Blues grounds, which had been lengthened to 110 yards for the semifinal. The Chicago Daily Tribune reported on April 14 that Pullman would be wearing red, Bethlehem royal blue. Following a 30 minute exhibition game between two Chicago youth teams, the semifinal tie kicked off before 4,000 spectators in conditions that Davis reported in the Daily Tribune as “well nigh perfect.” After 12 minutes of play, Bethlehem outside left Fleming was the first to take a shot at goal, but his shot was wide. Few real chances followed before the teams changed sides for the second half. The Daily Tribune reported that by the second half the teams “were playing great football and the crowd was kept on edge as each territory was in turn invaded.” But by the end of regulation time the scoreline line remained level at 0-0. The first period of extra time was “full of action” but “while both goals were threatened, the defense men held the upper hand.” Play slowed down in the second extra time period and, with darkness descending, the final whistle saw the game scoreless. Some 3,500 spectators came to Taylor Stadium for the April 22 semifinal replay. 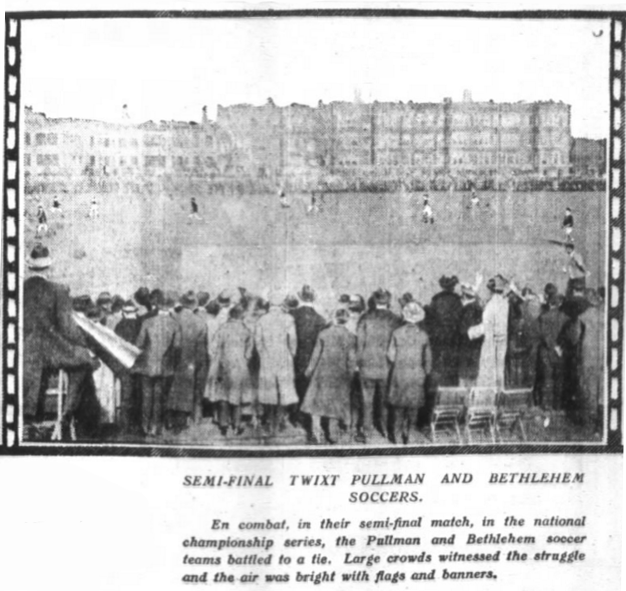 Rain throughout the night before the game made for slippery conditions but fans were treated to a thrilling Cup tie that featured a relentless Bethlehem attack against an inspired Pullman defense, particularly on the part of the visitors’ American-born goalkeeper Holmes. 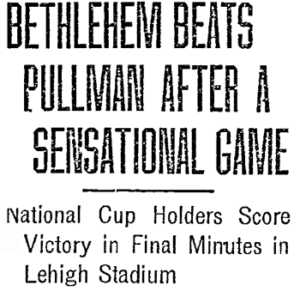 Bethlehem finally broke through the Pullman’s defense before the end of the half when “on a long pass from the middle of the field [center forward] Clarke broke loose, and headed into the net, both he and Holmes going into the net with the sphere.” The Bethlehem attack did not let up before the halftime whistle, but the score remained 1-0 at the end of the first period of play. Bethlehem would meet Fall River Rovers in the final of the 1915-1916 National Challenge Cup at Coates Field in Pawtucket, Rhode Island, on May 6, 1916. Thanks Ed. As usual the old stuff is a great read….”sent the sphere spinning into the net” no body today would write that…but they should! !